In the first of a new series, we offer all the keen gardeners out there some Pilates-inspired tips to avoid injury and back pain. Working in a garden can be physically demanding, but what can you do to make it less of a strain? Here are our top tips for protecting your back while gardening, and some exercises especially for gardeners. (1) Warm up before you start. Obvious but essential! Just a few gentle stretches could make all the difference. (2) Use a kneeling pad to protect your knees. Hard surfaces can be uncomfortable, but you don't have to put up with it. Kneeling pads can be purchased from garden centres, or make your own out of some old textiles. (3) Switch between different tasks frequently. Often gardening requires us to stay in the same position for long periods of time, or do the same thing over and over again. Swapping between different jobs helps you avoid stiffening up or straining yourself through repetitive movements. (4) Bend at the knees at least as much as you bend at the waist. When you bend over from your waist, you put a strain on your lower back - this is a real danger for gardeners. Ideally, we should bend at the knees most of the time. However, if your knees are stiff, try alternating between a knee-bend and a waist-bend... But, when lifting anything, always bend at the knees! (5) Use a smaller trug or bucket when you're weeding. Using a smaller container means you'll fill it up more quickly, so you'll have to get up and empty it out more often. This may seem counter-intuitive but it means that you will never be tempted (or forced) to carry a really heavy container to your wheelbarrow or compost bin. This tip combines tips 3 and 4: you will protect your back from heavy lifting injuries, and change position more often. The 3 Best At-Home Pilates Exercises for Gardeners! Here are our top three stretches for gardeners to help prevent and relieve back pain. If you have any doubts about whether you're able to do these exercises... don't take any risks! Please consult your doctor, or come and talk to us in the studio. We offer a Free Trial for all new customers - click here to book yours now. A. The Back Stretch: "Cat up the Wall"! First, find a wall! Stand about 1-2 feet away from the wall, and place your hands on it a little bit higher than your head, so that your arms are straight. Look down towards your feet, so that your back curves outwards away from the wall, in a rounded shape. Now, slowly, look up and move your hips forwards, so your spine curves in the opposite direction. (Think of how a cat stretches.) Repeat 8 times. Stand with your feet shoulder-width apart. Hold on to your stick, cane, or hoe with both hands, with your arms open wider than your shoulders. Now rotate your upper-body to the right, while keeping your hips, legs, and feet completely still. Return to the centre and repeat to the left hand side. Keep your hoe, cane or stick nice and level as you move! Repeat x 8 on each side. Stand with your back against a wall, and with the weight in one hand, gently let the weight of the stone pull you down and bend sideways. Make sure the back of your head is touching the wall all the time so you stay properly aligned. Return to the upright position, place the stone in the other hand and repeat on the other side. Complete 4 bends on each side, swapping the stone from one hand to the other each time. Top tip: Check that the back of your head is touching the wall, but your heels are about 2-3 inches away from the wall. 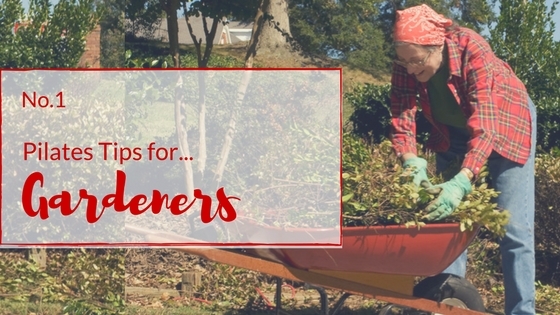 Follow these tips to stay pain-free while you work in your garden this autumn. Keep your eyes on the blog for more Pilates-inspired tips for cyclists, swimmers, and more in the coming months!